If you’re a parent, you’ve probably tried every type of motivation—reasoning, cajoling, nagging, threatening punishments, even bribery—to get your kids to do things that they just really need to do. Eating vegetables. Getting dressed for school. Going to bed. And yes, brushing their teeth. Good oral hygiene is about more than a winning smile. It contributes to our sense of self-esteem and confidence—and what parent doesn’t want a child who’s happy, confident, and proud of him or herself? What you might not know is that oral health contributes greatly to your—and your child’s—long-term holistic health. Poor oral health is linked to diseases including obesity, diabetes, and even heart disease. Encouraging your children to take care of their teeth sets them up for a lifetime of good oral health—and good health in general. One way to make sure children take oral hygiene seriously is by starting early. Wipe their gums with a soft washcloth after bottle feedings, and once their baby teeth come in, brush them twice a day with a soft toothbrush and water. Toddlers aged two to four can begin brushing by themselves, preferably for two minutes, but don’t use fluoride toothpaste until your child knows not to swallow it. Start flossing your children’s teeth around the same time, as their teeth start to fit closely together. If you haven’t already brought them in for a first dentist’s visit, now is the time to start as well. Children don’t have the coordination to do as thorough a job as adults. They may not even be able to use dental floss until they’re 10 or so. ; (Floss picks are easier for young kids.). But the key is to begin building good oral hygiene habits early on in life. Visit a dentist regularly for checkups. There’s always a temptation to tell others—kids, especially—to behave a certain way, even if we don’t always do so ourselves. Be kind to strangers. Share. Be generous. But children learn more by watching their parents and friends every day. If you take good care of your teeth, they’ll learn implicitly that oral hygiene is important and worth practicing. It’s understandable that bathroom routines are “private time,” but don’t be shy about brushing or flossing in front of little ones. They’ll pick up good habits that way. It’s not advisable to turn brushing or flossing into a race, but you can always make it a game of see-who-can-brush-the-longest or use a sand timer. Kids often feel like they don’t have choices—so let them pick out a toothbrush with their favorite character on it or a toothpaste flavor they like. Give out rewards—just not candy, please! Remember, we’re here to help. 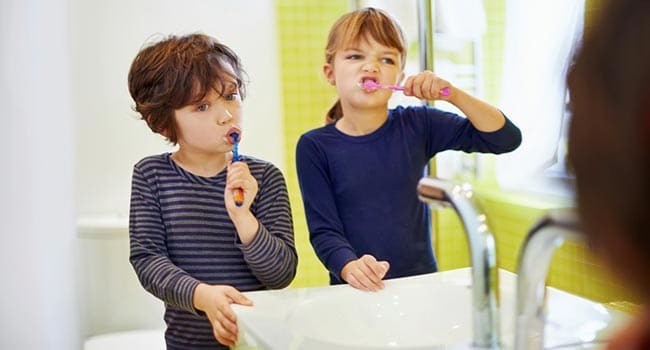 Day-to-day hygiene routines are the foundation of lifelong oral health, so there’s no substitute for the time you spend with your children, teaching them the fundamentals of brushing and flossing. But at Marquis Dental Center, we’re here to help. When you bring your child in for a visit, let us know if you have any concerns or issues you’d like to discuss. We want to make sure that your kids have a positive, friendly, age-appropriate dental experience each and every time they come to our office.